The International Bigfoot Conference is an annual event that takes place in Washington state every year. This year the conference will take place on September 2-4, 2016. Kennewick, Washington recently hosted a Bigfoot conference and KVEW-TV News was there to document the event. This is the news clip that was featured on the local news in Washington. I think news reporters get a kick out of covering Bigfoot stories. They always seem to laugh or poke fun at the subject. For more information on this year's conference click here. You are mistaken. This news clip concerns the conference that just wrapped up there in Kennewick. 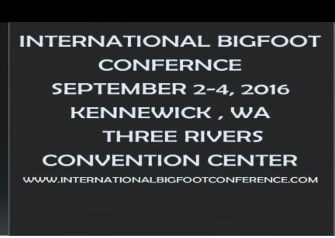 This Sept. International Bigfoot Conference will be the first. But it promises to be stellar.